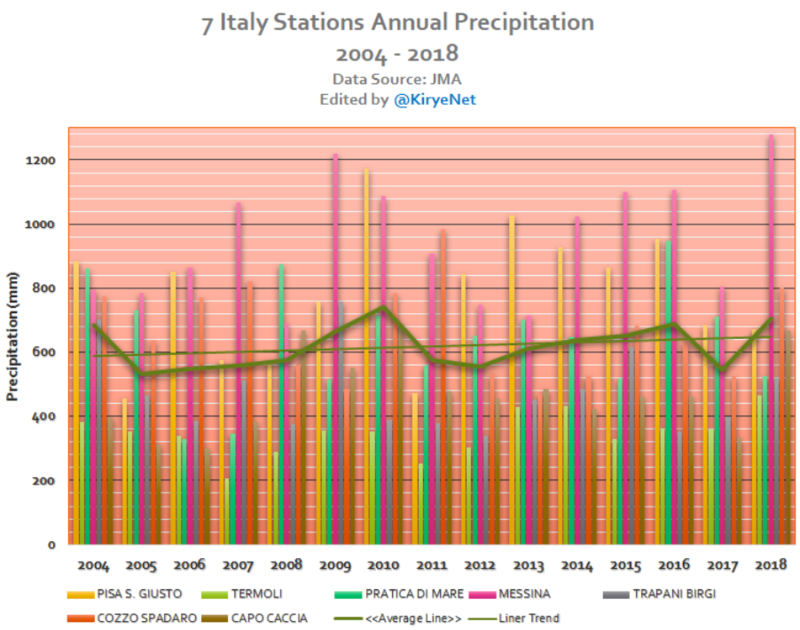 Browse: Home / 2019 / March / 26 / Year 2000 Predictions By ‘The Guardian’ Turn Out To Be Complete Failures…Southern Europe Has Become Wetter! 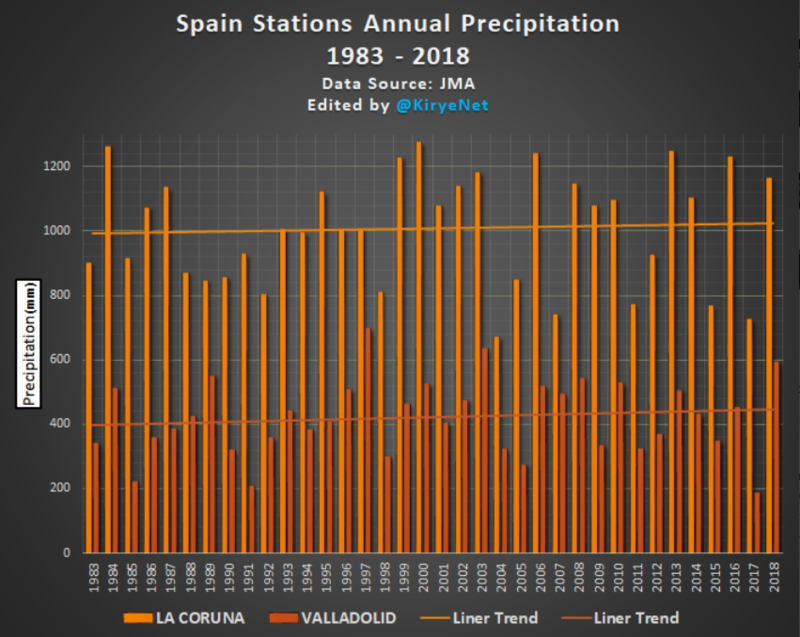 Both La Coruna and Valladolid stations show more precipitation since 1983, thus contradicting predictions of less. Which of these stations is located in Southern Spain? None is. 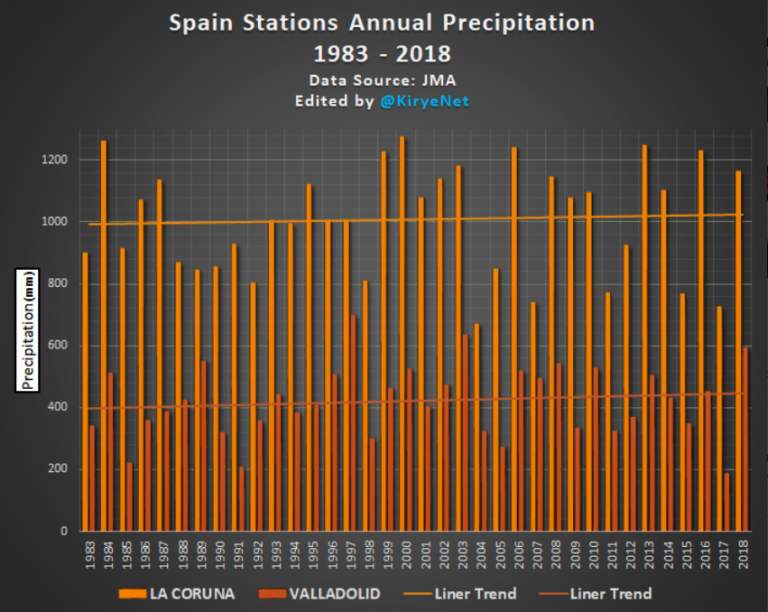 In 2012 Spain experienced a record dry period. 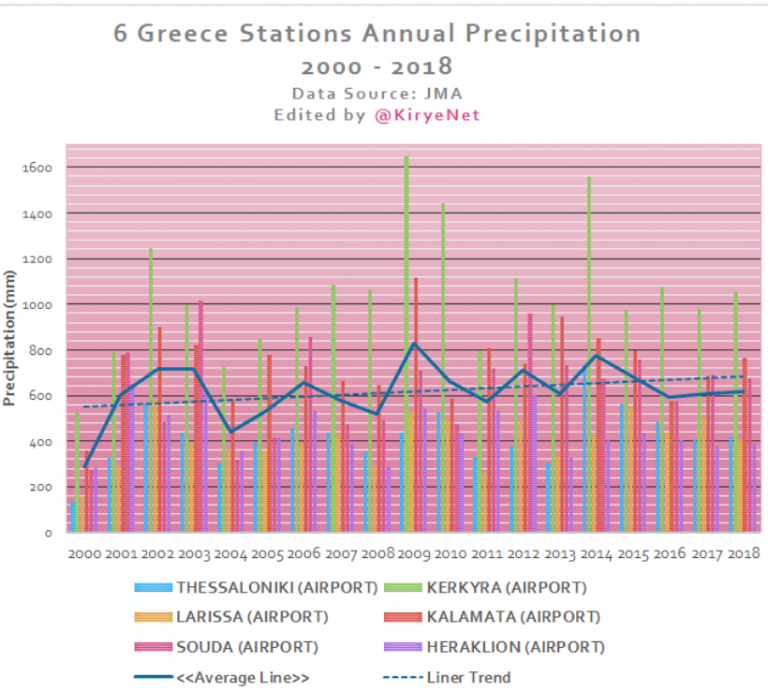 Is Heraklion in the north of Greece? Is Messina in the north of Italy? Yes, the 2 stations are not from southern Spain. 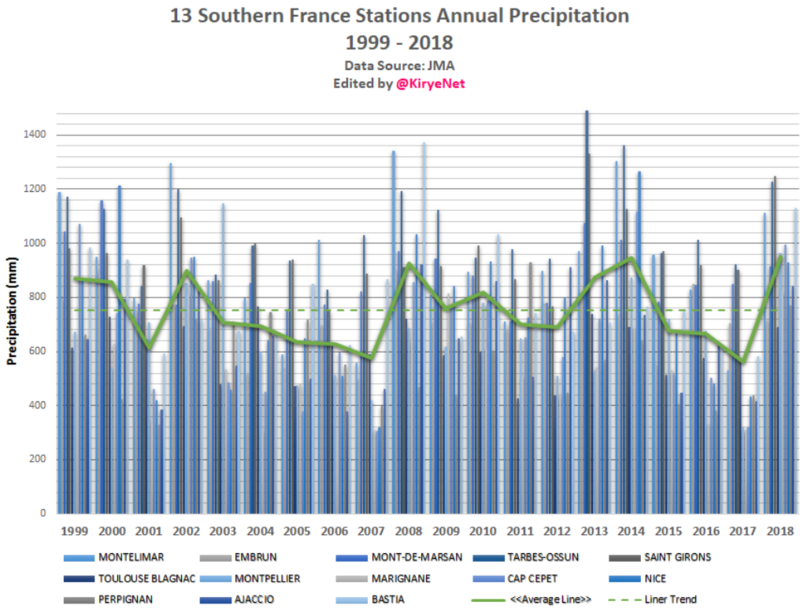 But the overall wider southern Europe picture and trend is one of increasing precipitation. 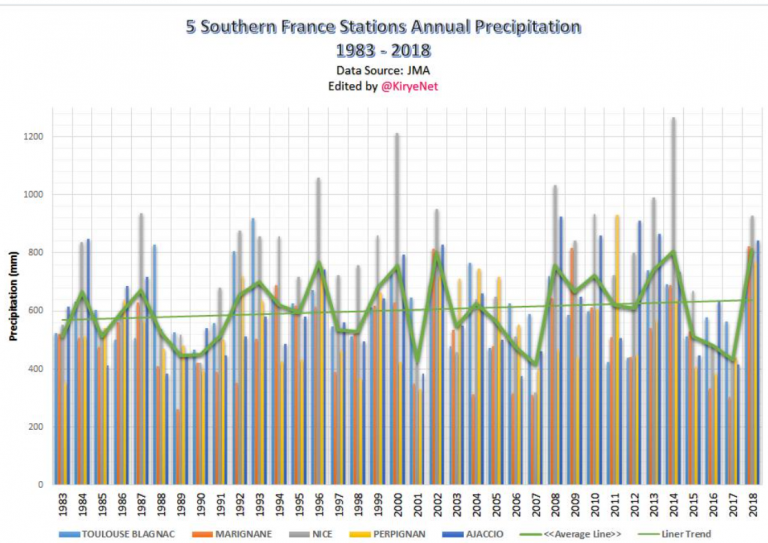 Moreover, The Guardian and other alarmist outlets always quick to point the finger at climate change to blame for drought and “desertification”, yet rainfall is going the other way – and so is the overall Sahara trend, which is one of greening. A year here or there of drought does not constitute a trend, nor does speculation about the future. The Guardian, the comic for child-minded adults, the paper that is little more than a vanity publishing outlet for whoever wishes to be the editor/owner. A comic that is built on BS! UK Guardian publicly decries the use off-shore accounts for tax purposes, while using them to hide their finances, and then it tries to convince the public it’s part of a ‘charitable trust’. I mean it has to be true! It’s The Guardian that is exposing a secret Pentagon report after all! Sebs scripture can’t be wrong! So who cares about a little rain one way or another in S. Europe? Disaster is upon us and we skeptics who survive will all be humiliated for all time while the Sebs of the world will be telling us I TOLD YOU SO! Oh, you mean this report? This scenario makes plausible assumptions about which parts of the globe are likely to be colder, drier, and windier. Although intensified research could help to refine the assumptions, there is no way to confirm the assumptions on the basis of present models. Rather than predicting how climate change will happen, our intent is to dramatize the impact climate change could have on society if we are unprepared for it. Where we describe concrete weather conditions and implications, our aim is to further the strategic conversation rather than to accurately forecast what is likely to happen with a high degree of certainty. Even the most sophisticated models cannot predict the details of how the climate change will unfold, which regions will be impacted in which ways, and how governments and society might respond. That’s neither “my scripture” nor is it an actual prediction. It’s a scenario of what could happen in the event of extreme climate change and the implications to US security. Oh yes, the Guardian is a scripture for all you deniers of real science. I don’t need to try very hard at all to make you folks look foolish since you do it yourselves all the time. That Pentagon study was supposed to be an for aid war planners to formulate contingencies for conditions in future areas of conflicts. At the time of it’s publication it made the rounds and was much publicized as proof that the US military was predicting catastrophic climate change conditions. None of what it has claimed was plausible has happened or appears about to happen. It was and is fiction for the neurotic who live in a fictional world where the climate is going to turn and kill massive numbers of people. IOW it is a LIE to deceive the dups of this world that believe in that crap. Own it! It’s who you are! Sadly, she hasn’t been active for a number of years. Hopefully she’ll return to the net. Her material was always excellent. As I posted elsewhere Yonason. At one time the alarmists of the world were amusing to me, but no more. Now they have become a threat. This not just about politics. They have become a threat to my nations survival, my personal liberties, and to the prospects for prosperity of my offspring, and in fact the welfare of the whole worlds population. They are not funny anymore. This has become an ever deepening and bitter world war. A war where the press censors the views of skeptics in the west. A war where our classrooms and major organs of the press have been taken over by the enemy. Yes. Anyone who dismisses them as just clowns to be laughed at, doesn’t understand the threat they represent. IOW it is a LIE to deceive the dups of this world that believe in that crap. Own it! It’s who you are! rah, the thing is you are the ones falling for lies. So no, I won’t “own” what you want me to own, especially not when you write replies like this one. Name a single climate change catastrophe that has been predicted that has occurred or is occurring! Explain why the permanent hot spot in the in the upper troposphere of the tropics has not been found despite the fact that the physics upon which the IPPC climate models are based demands that it be there. I and others have also asked him for that and other info. Just as he gave no suitable answers then, he’ll give none now. Insult, deceit, mockery and redirect are all he ever provides. I don’t anticipate any improvement. Not a chance of cAGW advocates offering real physical evidence — they have none! All they have is an unrealistic theory and unrealistic models. Their world is govern by the inaccurate climate models, models that can only accurately predict what happens on a virtual Earth but not what happens on this planet. At first I would give SebastianH the benefit of the doubt in that he was attempting to understand how this planet’s climate operates. I know now that I was wrong. He is here just to blather on with an opinionated UN-IPCC deceptive nonsense, distractions, and insults. He is this blogs fool! Offering nothing but just trying hard to make anyone with views contrary to his look small. My advice, do not treat him seriously, he and his opinions are just a bad joke that offer no enlightenment to the topic of any post on this blog. Really I am saying it long past the time to take off the gloves. No quarter given just go in for the kill. To give you an idea how I mean that let me explain an exchange with a nephew of mine last Christmas. We have a close family and I like my nephew. He works in the family business which is metals fabrication and warehousing. He is in charge of running the CNC Plasma, water jet, and oxy acetylene cutting tables. He approached me on climate change questioning my beliefs. I didn’t fool around trying to teach the kid science or arguing the science. I just pointed out he drove a corvette and just bought a house with natural gas heat and he worked in an industry that the greens believe to be bad for the environment. Then I told him when you start walking the walking instead of just talking the talk I’ll believe you mean it. Till then you just being another climate change hypocrite. I walked away.